The vQuiets are over the ear headphones that include noise cancellation technology which aims to reduce the noise of trains or planes. Their main competition in this market are Bose and whilst you will almost certainly have heard of that brand Velodyne are a relatively new name to UK audio. They are not a new company though having been for a long time probably the premiere maker of Sub-Woofers in the USA. When you first plug in the vQuiets, using the very rugged 3.5mm cable supplied that handily can plug in to either side of the headphone, you will hear that SubWoofer legacy in troves. The bass from the 40mm drivers is immediately very impressive, not in an artificially boosted way like some of the bass centric headphones, but in a powerful but very natural and compelling way. These were the first headphones to ever pass one of the tests I always use which checks frequency response from 10hz up.to 200. Whilst 10hz is inaudible they showed a linear response all the way form there to 100 and beyond. Very impressive and you can hear it. 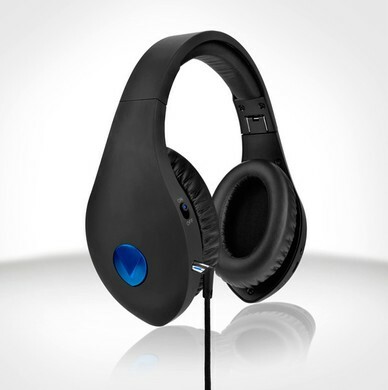 Put simple if you like natural powerful bass you will love these headphones. Velodyne rate them as having a 20Hz to 23khz range and that naturalness and clarity extends throughout, with the tests showing a very linear response with minimal harmonic distortion. This means the headphones sound clean and transparent from bass through midrange and onto the highs with a shocking amount of detail. Even without the noise reduction they would be a good buy. I was also impressed that the stereo imaging was rock solid with no sense of drift between phones over the frequency range. Listening to the binaural test track we have of a door being knocked on to the far left and far right had me convinced someone was actually knocking on my door and wall. The soundstage is wide and natural. At no stage did I feel closed in by these phones. I said noise reduction at one point earlier but I really should say cancellation as that is what these units do. They monitor in realtime the ambient noise and play counter sounds to cancel out annoying bass rumbles. I tested this on a train and it was fantastic - the continuous background rumble completely disappeared but announcements etc. were still audible - which would be a safety consideration when using them on airplane. One nice touch here is that the left ear pad has a large button on it, in the shape of the Velodyne logo, which once pressed mutes the audio so you can hear people talking to you - simple and very effective. One of the problems that normally occur with noise cancellation is that the process introduces a significant degradation in the audio quality of the playback medium. With the Velodynes there is only a minuscule loss of clarity and they remain eminently good to listen to. Whilst you can notice this difference when compared to having noise cancellation turned off onthe vQuiets compared to most other headphones they still sound fantastic. This makes the whole journey experience a real pleasure and it is easy to lose yourself in the music despite the location. In physical terms the vQuiets have quite large ear pads making for a comfortable wear whatever your ear size, mine are sometimes compared to dumbo and often over the ear headphones are uncomfortable for long duration use. The Velodynes remained comfortable in many hours of use. The other thing I liked was that I was able to wear them comfortably with glasses on. I’m told by our smaller eared reviewers that they work very well with smaller ears too. They do fold up but even are still a significant size but although they may not meet the needs of the small suitcase traveller I would be prepared to make an exception to make room to carry them - they are that good. The noise cancellation is easy to switch on and off so they are able to be used as normal headphones when it is not needed. As previously mentioned each phone has a 3.5mm connection for the headphone lead making it very convenient to plug in regardless which side the source socket is- something which is particularly useful on aircraft where the socket is often in an armrest. As these are targeted at travellers i would have liked to have seen an airline audio convertor included but this is a small point and most airlines are moving away from these strange two pin connectors anyway. The headphones need to be charged for noise cancellation use but do not draw any power when this is not being used. Power is through a Micro-USB socket and supplied USB cable which can be plugged into any USB power source such as a PC or maybe a phone charger. There is no power supply included but I agree with Velodyne that it is a reasonable assumption that most people will have some form of USB source these days. You will have gathered I really liked these headphones and I really didn’t want to send them back. They are clear, have amazing detail, are transparent across the range with fabulous natural bass. As for that competition I mentioned earlier… what competition. If you travel a lot do your ears a favour and audition the Velodyne vQuiets.